WOULD-BE prime minister Clive Palmer has launched a range of Freedom of Information applications to find out how confidential communications between his mining company, Mineralogy, and the government were leaked to the media. He has also called on Prime Minister Kevin Rudd to ensure the commercial business of the Government won't be abused. The Mineralogy chairman and candidate for the federal seat of Fairfax has lodged FOI applications to the Department of Infrastructure and Transport, the Department of the Prime Minister and Cabinet, to Mr Rudd and to Deputy Prime Minister Anthony Albanese for access to documents relating to Mineralogy's interests in the Port of Cape Preston. The action follows media reports by the The Australian newspaper and ABC website that Mr Palmer said were confused and misleading. "I aim to find out how confidential commercial communications between Mineralogy and government statutory bodies found their way into the public domain resulting in misleading reports,'' Mr Palmer said. A spokesman for The Australian defended the newspaper's reports as factual and said the company would not reveal its sources to Mr Palmer. "The Australian will not be assisting Mr Palmer in his attempts to discover the confidential sources for our factual articles that Mr Palmer would rather never see in print," a statement from the company said. Mr Palmer said he was disappointed that limited confidential communications and information appear to have been cited by The Australian newspaper and the ABC website, as provided by government sources with encouragement from Mr Albanese's office and in breach of obligations owed by public servants to keep the matter confidential. "As I'm standing for Prime Minister in the next federal election I find this most disturbing and call for Kevin Rudd to discuss this matter urgently with his deputy to ensure that the commercial business of the government won't be abused," Mr Palmer said. "The Port of Cape Preston is located at a remote location in the north of the Pilbara region in Western Australia. "Mineralogy holds exclusive rights of occupation over the land at that port. On 31 January 2013 Mineralogy was gazetted by the Federal Government as the port operator for the purpose of federal maritime transport and offshore securities laws. "Those Federal laws relate to the security of ports around Australia. They deal with matters such as terrorism and other security threats and in no way relate to the commercial operation of the port in a commercial sense. "It is normal that these matters be dealt with by government statutory bodies. The Security Act allows private companies to be appointed and the Federal Government decided to gazette Mineralogy with that role. "My understanding is that after the removal of Julia Gillard and the appointment of Kevin Rudd as Prime Minister, his deputy Anthony Albanese gave directions to remove Mineralogy in this matter. "That appointment is separate from Mineralogy's legal and commercial rights in the port under existing Western Australian state legislation with project proponents, including the CITIC parties amongst others. "Those underlying commercial agreements have been in place since 2002. All assets vest in Mineralogy under the agreements scheduled to the Iron Ore Processing (Mineralogy Pty Ltd) Agreement Act 2002. "The scale of the projects under those agreements, including operations for the Sino Iron Project, amongst others, are of significant interest to Mineralogy and the WA State Government. "Those agreements have always contemplated Mineralogy as the port operator so that it can co-ordinate the export of iron ore from a number of separate projects to be developed on its iron ore deposits. The Sino Iron Project is but one of those projects. "Mineralogy remains appointed by the Federal Government as the port operator for the purpose of federal maritime security laws and it looks forward to working with the State and Federal governments in that role,'' Mr Palmer said. 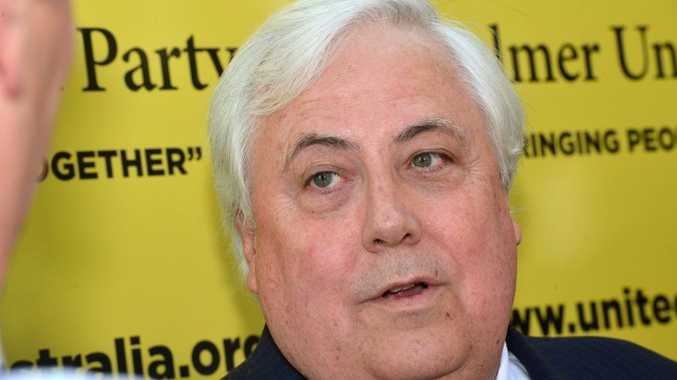 Will Jeff the T-Rex feature in Clive Palmer's first paper?